I saw a mention of CalSci in another post, maybe the one about the Laminar Lip, and googled them to see what they're about. I saw that they had a listing for the HyperStrada screen but it was "under development" and "available April 7th". Seeing as it is May, I emailed them to ask and got a reply from Mark at CalSci letting me know he'd gone and updated the page. I like it. May go for it. Gonna give myself some time to see if I really need it. I told Mark that I'm 6' with a 33" inseam and that the stock screen makes for a pretty noisy helmet and some pressure on my upper torso. I asked what his screen would do for me and his reply was "You should get smooth air behind this screen, so if you're riding with a full face helmet it should be reasonably quiet. This is a smaller windshield designed to take the pressure off your torso on the freeway, not to turn your bike into a 1,000 mile per day touring rig." Well, duh. I've owned a Gold Wing. I know my HS is not a touring bike. His site is full of snarky stuff like that though. Seems like a bright guy though. The specs show it's wider at the bottom and top, and 4" taller than stock. What do you guys think? here's an MS Paint mockup, but this is comparing a pic of the optional DP taller touring screen, not the stock one and all I could do was make sure I matched up the bolt holes and lower point shape. gives the general idea anyway. Maybe someone can stitch a pic of their HS from the same view side by side with the pic from CalSci. Last edited by NurseDaddy; May 15th, 2014 at 11:39 AM. a question to the engineers here that i've been meaning to ask a long time ago. the mounting bracket of the HS screen seems flimsy and too loose at its attachment points around the headlight. to me, it's not solid enough. it doesn't take much to shake the tip of the oem screen fore and aft. We've talked about this before. I think there's a certain amount of flex built in to the screen bracket but, good point about too much surface area pressure on larger screens. I watch it dance at high speed in gusty afternoon winds often and am confident it isn't going to snap on me. If it is only the windscreen to change it will be crap because it is so big that it is "working" too much in the wind. It would need an additional holder which gives it stability - than it would be an option. I've had aftermarket windscreens on naked bikes, like my 1991 Honda Nighthawk. The screen would have rods on swivels that would reach the handlebars and clamp into bar-mounted rod holders. Pretty stable. So, lets say one were add these rods so as to elminiate flex of the screen and factory mounts... then what would you think? it will take some searching, but a member on here braced his windscreen just like you're talking about way, way back when we first started taking delivery of the 13's. It looked awful. I almost ordered the laminar lip, but its tacky looks kept me from actually buying it. Honestly, my bike time is limited to ~20 mile commutes in stop and go, and the occasional weekend local ride. I don't think I need a different screen for keeping pressure off my shoulders and torso, its mostly because the air is noisy. The stock screen on this bike is much better than the KTM "touring screen" I'd added to the Duke. It was useless at keeping me from being a sail at anything over 60mph and noisy at every speed. That bike was quieter without the screen but you'd have to hang on for dear life at 50mph. 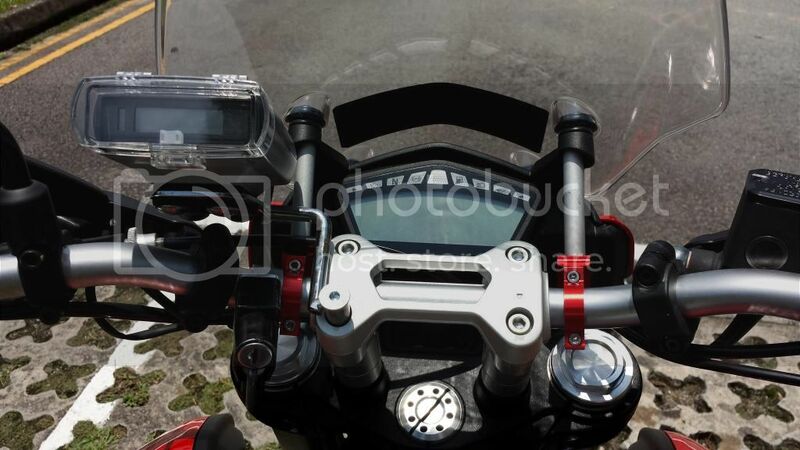 if those brackets clamped to the handlebar came in black (instead of red) and the corners rounded off (to match the handguard brackets), they don't really look that bad at all, imo. I purchased a windscreen from Cal Sci and would not recommend others do so. When it arrived it had the mounting parts in a ziploc sandwich bag with no parts list or mounting instructions. Based on the vague instructions on the site I realized they hadn't sent everything needed. The person I talked to said I was the first one ever sold. They did send me out a replacement mounting kit but this ALSO did not have the required parts. I'm trying to return it but they're not responding to my request, it's very frustrating. If it was inexpensive it might be worth dealing with, but at $140 it's getting close to what the ducati touring screen costs. I saw this and your other post. Thanks for the heads up, and sorry you're having frustrations with it. I had hopes for it being a good option, but from what you're saying it needs more time and effort on their part. Shame. I hope they rectify the situation for you. I wish they'd send you all the right parts so that you could at least mount it and see how it works before you return it. Can you take pics of all the parts and how the holes line up (or dont). Maybe we can MacGyver it somehow. My factory screen is currently installed with some extra grommets and longer screws to change the angle of it. I'm not afraid to tinker. Even with the angle changed it still aims the noisy wind right at my helmet. Annoying isn't a big enough word. I'm still tempted to remove the screen altogether and go with the tiny carbon fiber one, which costs way too much for what it is.